Builder Supply Outlet - How to Choose The Right Kitchen Countertop! Home > Blog > How to Choose The Right Kitchen Countertop! How to Choose The Right Kitchen Countertop! It may be tempting to choose a countertop based on looks. But you must also consider durability, maintenance, and price. You must completely assess how you live, as well as your cooking choices before deciding what countertop surface to choose. For instance, white is not a good color choice for families with little kids making peanut and jelly sandwiches daily. If you find that you have your heart set on a certain look, but the material you want doesn’t match your lifestyle – there’s a chance that another material will work great. Granite, which is the top choice for countertops, is available in a slew of shades including black, white, green, coral, and even beige. No two pieces are exactly the same. It’s available in two finishes. A polished finish that results in a shiny look that can darken the appearance of the stone, while honing it’s soft and matte. Costs for granite depend on many variables, including color, finish, and origin of the stone. If you pick a granite that’s relatively easy to get, it could be affordable. If you pick a granite imported from say Zimbabwe, and it only ships once a year, it can be pricey. Other natural stone materials, like marble, limestone, and soapstone, are softer than granite and require delicate use and far greater care. And of course, all stone countertops must be sealed periodically. Engineered stone countertops come in a wider variety of colors than natural stone countertops. And they’re more durable, as well as a cinch to maintain. They’re pretty bulletproof. What’s interesting is that engineered stone won’t save you money over granite. the two materials cost roughly the same. Solid surface countertops have a lot of appeal. They come in countless colors, are seamless, resist stains and scratches, and can be buffed out. One word of caution, though: Hot pans can damage solid-surface countertops. Concrete countertops, which can be completely customized with pigments, are gaining popularity. It’s available in several different finishes including trowel (smooth), ground (sanded to expose the sand aggregate) and pressed (a tool is used to reveal marblelike veining). Extreme or abrupt changes in temperature may cause concrete to warp or curl. Damp sponges left on the counter can cause discoloration and acidic spills may etch the surface. To keep a concrete countertop looking its best, it’s advisable to seal them up to four times per year, and wax with a paste every 2-3 months. Wood countertops, like butcher block, instantly warm up a kitchen. They are easy to clean and any scratches can be sanded out. Water damages butcher block quite easily. Therefore, wood countertops must be oiled frequently to seal the surface. Laminate is the most affordable countertop material on the market and comes in an array of colors and designs. Laminate can scorch if a hot pan touches the surface and has a reputation for scratching easily. However, the product has made strides in scratch-resistance in recent years. Square edges are standard on most countertops, but decorative edges like radius, bullnose, bevel, egg, and ogee (while a bit more expensive), are another way to customize a kitchen. Availability of edges varies based on countertop materials. If you’re having challenges selecting countertops, just visit the Edge Kitchen and Bath Showroom. You’ll see all these options up close and personal with a FREE Edge Kitchen and Bath Designer. Hopefully this brief article gave you an insight into choosing the perfect kitchen countertops. And of course, Builder Supply Outlet and the Edge Showroom carry the top kitchen cabinet brands including Waypoint, Shiloh, Aspect, Eclipse, Prior Creek, MidContinent, and Bertch. 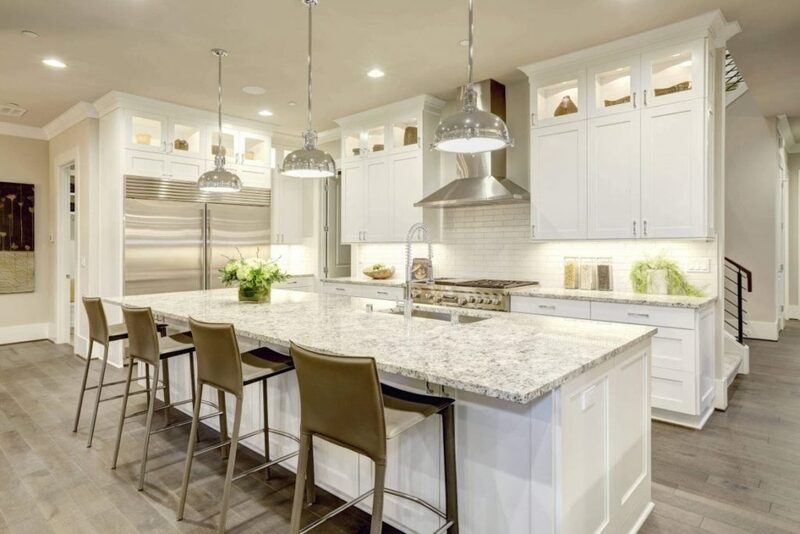 Stop in anytime to learn more about kitchen cabinets or make an appointment and meet with an Edge Kitchen and Bath Designer absolutely FREE by clicking here. Feel free to stop into Builder Supply Outlet or the Edge Showroom with any home improvement questions you may have regarding cabinet hardware, bathroom vanity sinks, tops, remodeling, tile, backsplash, cleaning, sealing, grout, windows, kitchen cabinets, construction, contractors, designing/installing a new kitchen or bathroom — or anything else. We can help you through the entire design and installation process from A-Z. Or call us anytime in Broadview, IL at 1-708-343-3900 or in Orland Park, IL at 1-844-876-3343. You can also make an appointment to meet with one of our Edge kitchen and Bathroom designers at no charge by clicking here.